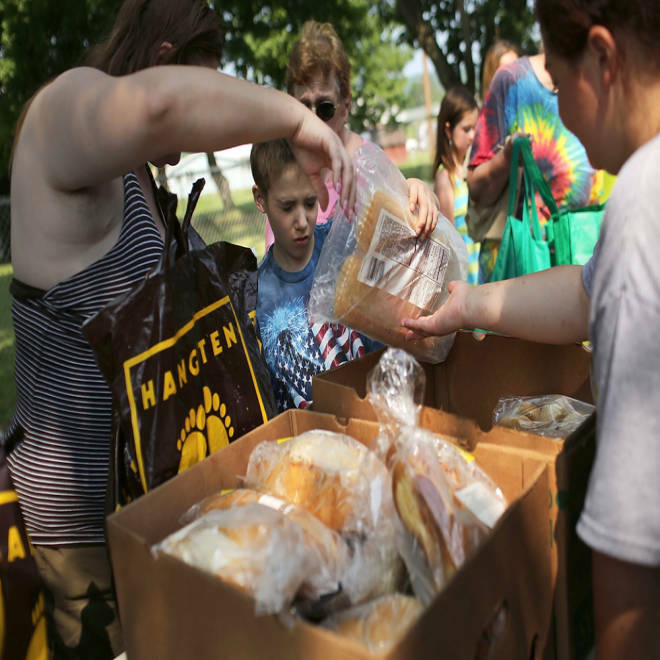 People are handed bread during a food distribution by the Food Bank of the Southern Tier Mobile Food Pantry on June 20, 2012 in Oswego, N.Y.
Across the country, schools are getting out for the summer. And while most students will leave their classrooms happy for the break, some parents will be fretting about how to feed their children without meals provided through schools. The hot summer months bring a fresh challenge for food banks in the nation’s poorest and hungriest counties: How to make sure millions of children get regular, healthy meals when they aren’t in school. “The time of year in the United States (that) an American child is most likely to go hungry is the summertime, and the principal reason for that is school is out,” said Kevin Concannon, undersecretary for food, nutrition and consumer services with the USDA. That often means summer vacations – not the winter holidays – are the busiest time of year for food banks, because they are struggling to fill the gap for children who are not getting regular meals through federally funded school lunch programs and other services. “We know hunger, just generally across the board, is a bigger problem in summer,” said Celia Cole, chief executive of the Texas Food Bank Network, which represents regional food banks across the state. Texas is home to six of the 10 counties in the country that had the highest rate of childhood food insecurity in 2011, according to data to be released next week by Feeding America, a nationwide network of food banks. All told, nearly 1.9 million Texas children, or 27.6 percent of kids in the state, were living in food-insecure households in 2011, according to Feeding America. Many food banks also see summer as a time to meet their most important need. “There is just nothing better that we could be doing than feeding a child,” said Eric Cooper, chief executive of the San Antonio Food Bank. That food bank serves 16 southwest Texas counties including Zavala County, where nearly half of county’s children were food-insecure in 2011, according to Feeding America. A household is considered to be food-insecure if at times they had difficulty providing enough food for everyone in the family because of a lack of resources. The San Antonio food bank and its partners will distribute more than 300,000 meals to kids this summer through the government’s summer food program. Cooper said that will serve about 10 percent of the kids who get meals when school is in session. “It doesn’t scratch the surface of the kids that are fed during the school year,” he said. True nationally tooThat’s true on a national level as well. About 21.4 million children receive free or reduced-price lunches at school on a typical school day, according to the USDA. Some of the nation’s neediest kids also receive breakfast, snacks, dinner and even backpacks of weekend food through school and after-school programs. But last summer, only about 3 million kids were fed through the federal government’s Summer Food Service Program, which provides meals to kids though school and community organizations, according to the USDA’s Concannon. Concannon and others say kids have trouble getting to feeding sites when school buses aren’t running, and parents aren’t always even aware that the programs exist. The groups that host the programs, in turn, are only paid by how many meals they serve. If turnout is low, it’s hard to justify the expense. Also, the program is mainly available only to high-need areas where half the kids were receiving free- or reduced-lunch during the school year. Experts say that when kids don’t have regular, nutritious meals, they learn more slowly and have more behavioral problems. They also can develop unhealthy habits, such as binge eating, that puts them at risk for obesity and diabetes. Kids who are hungry may take desperate measures to get through the summer, such as purposely failing classes so they can go to summer school and be assured of a meal, said the San Antonio Food Bank’s Cooper. “For communities like ours that struggle with graduation rates, I think the power of nourishing the child can just help in so many ways,” he said. To reach more kids, some food banks and community centers have tried to find innovative ways to bring food closer to kids. Sonya Morgan-Wallace will not have to go far to get lunch for her four kids this summer. The Oak Meadow Villa community center, located in her San Antonio apartment complex, will serve one hot meal a day on site to her kids, who range in age from 7 to 17 years old. The meals are provided for free through the San Antonio Food Bank, and funded by the USDA’s summer program. The program has helped sustain her family as they’ve struggled with unemployment and other setbacks. Six years ago, Morgan-Wallace was making $15 an hour, with health insurance, working in a doctor’s office. “We were self-sufficient,” she said. But she said she had to leave that job when her now 9-year-old daughter, who has cerebral palsy, needed extensive surgery and care. Her husband, meanwhile, had been out of work after losing a job doing transport at a hospital and suffering from a cornea disease. He’s received one cornea transplant and is looking for part-time work while he recuperates and awaits another transplant. The family also suffered a tragedy last year, when their 12-year-old son died after having an asthma attack. They rely on the community center for the summer meals and other services, including the emergency food pantry. “I’m so thankful that they have this program,” Morgan-Wallace said. Food banks innovateIn other parts of Texas, food banks and community groups also are trying more innovative ways to reach kids during the summer. About six years ago, officials at the Boys and Girls Club of Pharr, Texas, began noticing that many kids were coming to their after-school programs hungry, so they started offering free, hot dinner and a snack. Stephanie Leal, the club’s director of operations, said they noticed a change in behavior, attitude and focus. “Kids were having a better time because they were fed,” Leal said. The program will continue through the summer, offering free breakfast and lunch to about 640 kids who participate in summer activities, plus any other children who show up and want a meal. Summer meal programs will help, but it won’t be enough to meet all the need in Hidalgo County, where Pharr is located. “That’s certainly an important component, but when it comes right down to it, most of (the kids) are being fed at home,” said Terri Drefke, chief executive of the Food Bank of the Rio Grande Valley. The food bank serves three Texas counties, including Hidalgo, where around four in 10 children were living in food-insecure households in 2011, according to Feeding America. Drefke said they find that most effective way to keep kids fed is to get food directly to families, in churches and community centers that are within walking distance of people in need. “Our major focus is reaching the family, and trying to make the families accountable for feeding families,” she said. Editor's note: This report was produced as part of a collaboration with InPlainSight.nbcnews.com, TheGrio.com, NBCLatino.com, msnbc.com, and NBC's owned television stations.